Yesterday morning, Saturday 29th June, 2013, I woke up quite excited as I was sitting on just under 950 points as a Chaser. I knew that there was going to be quite a few activations during the day, and fingers crossed, this would hopefully take me over the 1,000 point mark. 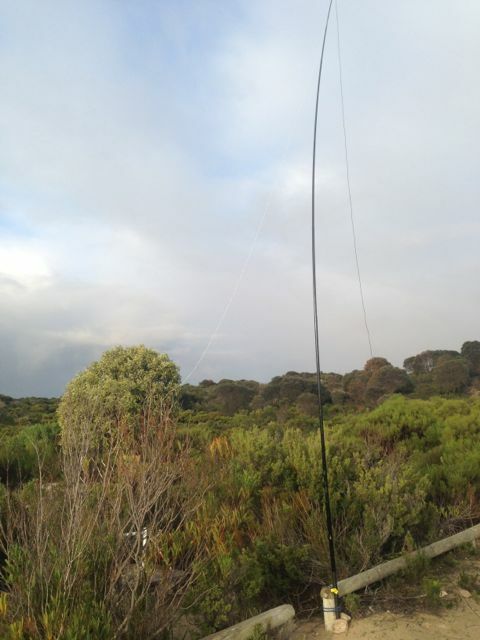 My first contact of the day was with Wayne VK3WAM/p, who was on Mount Ritchie. The SOTA goat bleated on my i-phone, so I rushed up to the radio room and spoke with Wayne. A good start with another 8 points to add to the tally. At the end of my QSO with Wayne, Andrew VK1NAM, asked me to QSY up 5, and I obliged. I had a good chat with Andrew, only to find out that he was very close to Shack Sloth as well, and he too, was hoping for a good day. And at 0258 UTC I tipped over the 1,000 point mark, after speaking with Peter VK3PF, who was on Mount Selma, VK3/ VT-013. The number 013 wasn’t unlucky for me in this instance. Thanks Peter. And by the end of the weekend, I had 18 SOTA QSO’s, and I am now sitting on 1,058 points. And I also found out that Andrew VK1NAM had nudged over the 1,000 point mark. So congratulations to you Andrew. My first ever SOTA contact was with Mike, 2E0YYY/p, on 1st December, 2011. He was portable on Moel Famau summit, GW/ NW-044, in Wales, and I was lucky enough to work him on 15 m SSB. This was my first ever exposure to SOTA. I hadn’t even heard about the SOTA program before this. It took another 5 months to pass, 22nd May 2012 in fact, before I would get my next SOTA contact. And again it was with Mike, who was using the special call of 2Q0YYY/p. This time he was on Shining Tor summit, G/ SP-004, in England. I had an enjoyable QSO with Mike on 20m SSB. 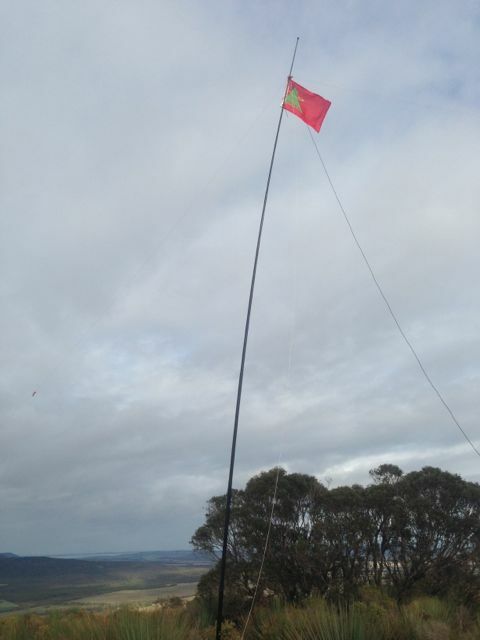 My first Aussie SOTA contact was on the 10th June, 2012, with Wayne VK3WAM, who was portable on Triple Peak, VK3/ VW-005. Between May 2012 and December 2012, I worked a total of 29 activators and reached 155 points. The Victorian VK3 Association had kicked off earlier that year, in February, but it was not until May, that I was bitten by the SOTA bug. 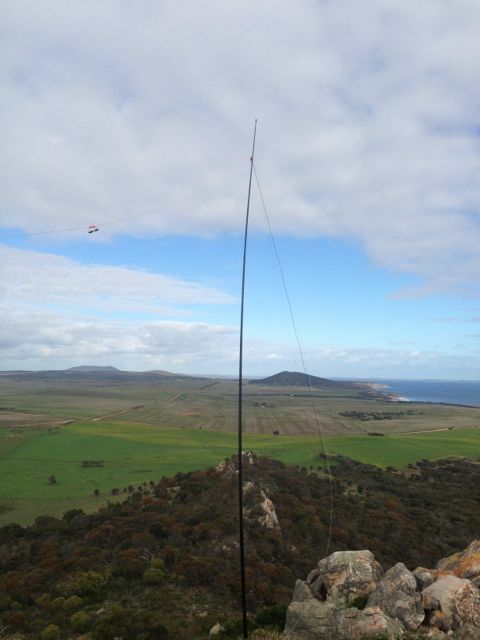 My interest really hightened with talk that South Australia was going to join the SOTA brotherhood, and in October the VK5 Association kicked off. Thanks to Ian VK5CZ and Wayne VK3WAM. 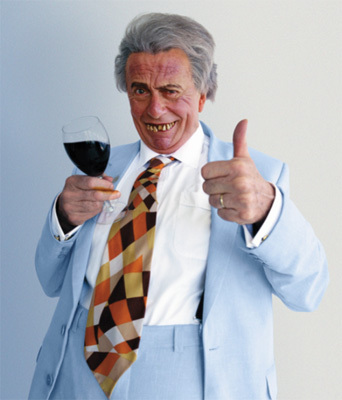 But it has been this year, 2013, that SOTA has really soared here in Australia. Activations in VK3 really took off, and in February, 2013, the ACT VK1 Association also joined the fold. So far in 2013, I have worked a total of 210 stations for a total of 901 points. Thankyou to all the guys who have made the effort in going out to activate a summit. Now that I have also become an Activator (started in March this year – 26 activations), I know that it is not just as simple as going out to climb the nearest hill. There is a fair bit of organisation and determination involved. But it is a lot of fun. For me, nothing beats getting out in the bush, going for a walk, getting fit, and enjoying the hobby of amateur radio at the same time. Wayne VK3WAM; Ron VK3AFW; Allen VK3HRA; Peter VK3ZPF; Peter VK3PF, Andrew VK1NAM, Ian VK5CZ, Rik VK3KAN, Matt VK1MA, Andrew VK1DA, Marshall VK3MRG, Al VK1RX, Ernie VK3DET, Ian VK1DI, Peter VK1IRC, Glenn VK3YY, VK3FMDV, Kevin VK3KAB, Warren VK3BYD, Rhett VK3GHZ, Brian VK3MCD, Andy VK5LA, Darren VK3FDJT, VK3XJM, VK3CBV, Chris VK3QB/VK9, Brenton VK3CBV, Glen VK1FB, Mark VK3DEE, Mark VK3PI, Ray VK3YAR, and Andrew VI100ACT. Other than my 2 DX QSO’s with Mike, I’ve been lucky enough to work a total of 10 other DX SOTA activators in Spain, Czech Republic, Hungary, Poland, Slovenia, and Greece. And every one of those has been a real thrill to get in the log. 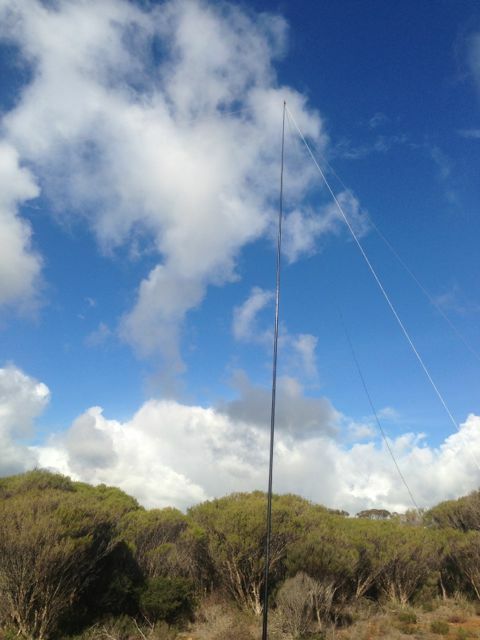 I hope that the rest of 2013 and the future, sees a lot more activity from South Australia, VK5. To date, there has only been a handful of activators, which is a little disapointing. I’ve enjoyed every minute of Chasing and again thanks to all you guys who have made the effort of climbing to the top of a summit. 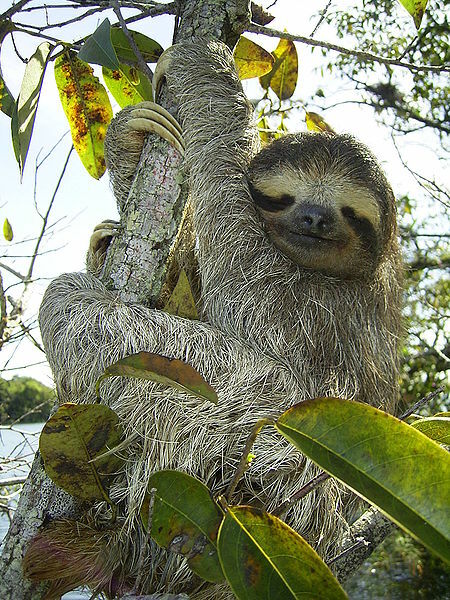 Now that I am a Shack Sloth, I can try to concentrate on my Activations. Our last radio stop of our 7 day trip to the Eyre Peninsula, was the Whyalla Conservation Park. 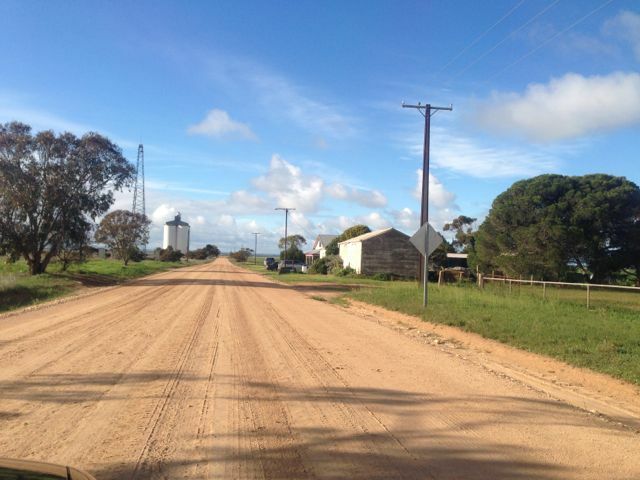 This was on Sunday morning, 16th June, 2013, on our way back to the Adelaide Hills. I had driven passed this park many many times, as we frequently travel to Whyalla to visit family & friends. But I had never visited the park before. Whyalla is situated about 383 kms north of Adelaide. Whyalla was founded in 1901 and was originally known as Hummock’s Hill. It was founded by the Broken Hill Proprietary Company (BHP) as the end of a tramway bringing iron ore from the Middleback Ranges. It is the 3rd largest city in South Australia. 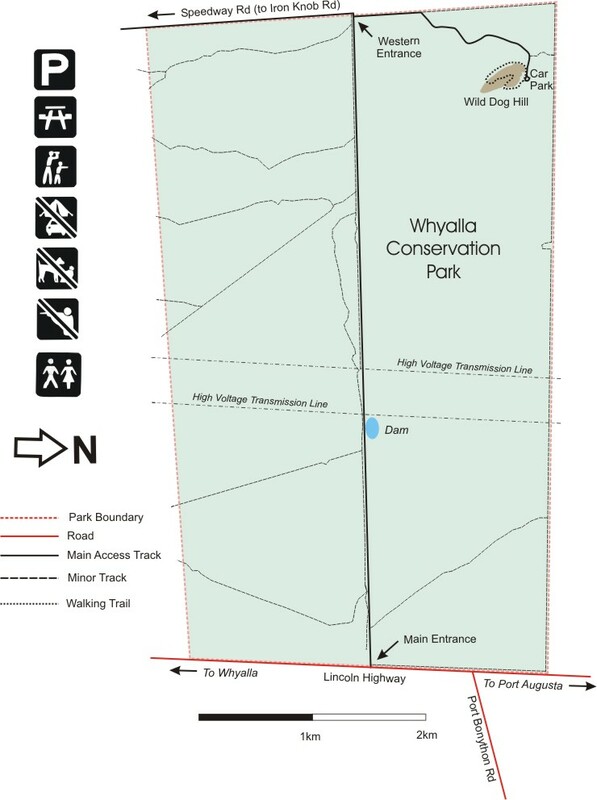 The Whyalla Conservation Park is situated about 10 kms north of Whyalla on the Lincoln Highway, just south of the Port Bonython turn off. It covers an area of about 2,020 hectares, and was proclaimed in 1971. It conserves a good example of the native flora and fauna of this semi-arid area. The land surrounding the park is pastoral lease used for sheep grazing. In fact the park was originally used for sheep grazing. 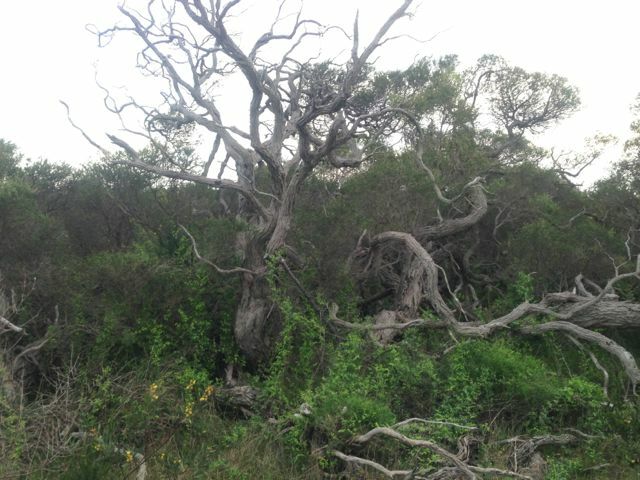 The park predominantly consists of low woodland comprising Western Myall and Acacia Papyrocarpa, with under storey of Bladder Saltbush and Bluebush. There are also Native Apricots, Quandongs, and Black Oaks. During spring, there are numerous wildflowers. The lichens on rocks, trees and covering the ground within the Park are some of the best examples in the world. The most prominent topographical feature of the park is Wild Dog Hill, which rised sharply to a height of 90 metres. Its rugged features and imposing profile make it a popular picnic location for local residents. Red and Western Grey kangaroos are found in the park, while euro can sometimes be seen on the slopes of Wild Dog Hill at sunset. At least three species of Dunnart (small carnivorous marsupial) are found in the park. More than 80 species of birds have been observed, including Wedge-tailed eagles and Australian Kestrels. 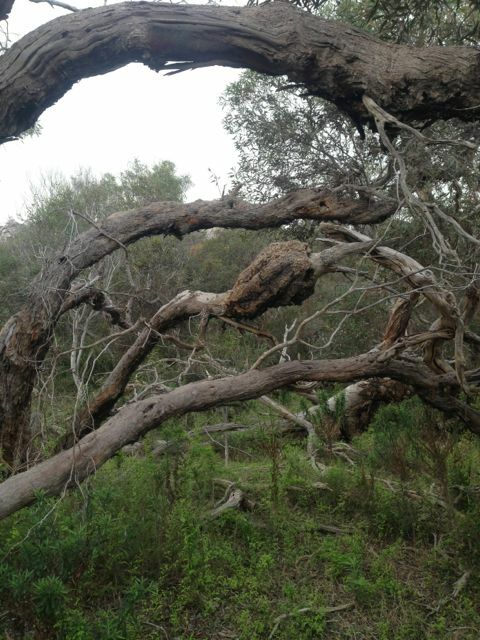 About 30 species of reptile have been found in the park including the deadly Western Brown snake and the Bearded Dragon. I set up the gear just inside the park boundary. I used my little Yaesu FT-817nd and 5 watts output, and my 40m/20m linked dipole on the 7m squid pole. 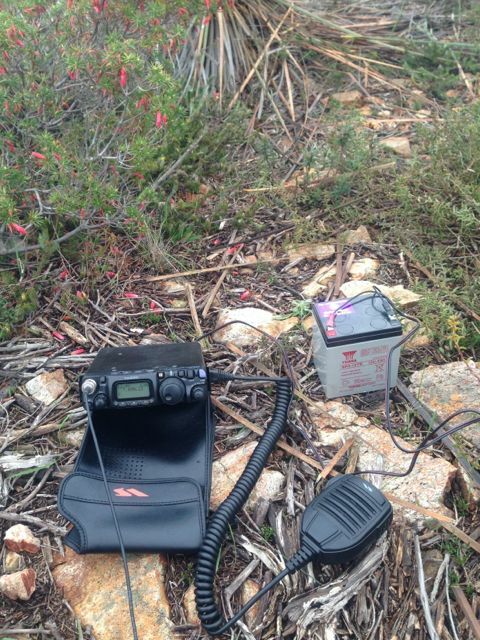 My first contact within the park was with Ian VK1DI who was portable near Wilpena Pound in the Flinders Ranges National Park. Ian had a nice strong signal, and we had a good chat with 5/8 both ways. Ian was intending to activate Binya Peak but this didn’t eventuate. I also managed four SOTA contacts. 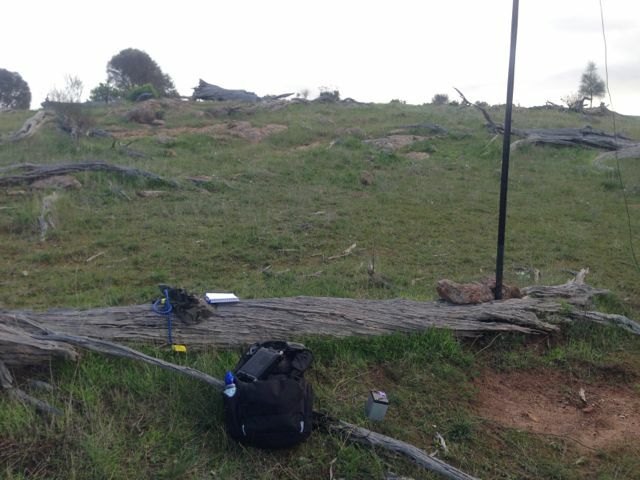 The first was with Glen VK3YY on Mt St Leonards VK3/ VC-006, who had a nice signal (5/7 both ways). Then I spoke with Marshall VK3MRG on Mt Despair VK3/ VN-013. Marshall was perfectly readable but his signal was well down. Sadly just 4/2 to me. I then spoke with Ray VK3YAR on Mt Tarrengower VK3/ VN-023. 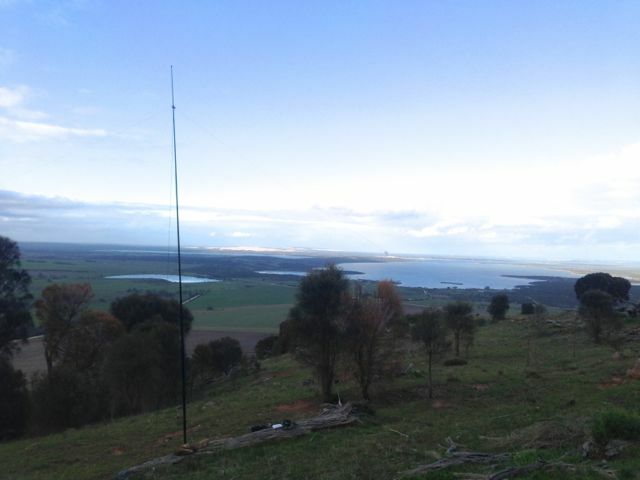 Then I spoke to Allen VK3HRA who was portable on Mt Ritchie, VK3/ VC-003. Allen had a strong signal (5/8 both ways). My last SOTA contact was with Kevin VK3KAB who was portable on Mt St Phillack, VK3/ VT-006. I also had an interesting QSO with Andrew VK2UH, who lowered his power down to .5 watt and was still very easy copy. After a quick stop to the park, I had 14 QSO’s in the log, including the 4 SOTA contacts. The following stations were worked:- Ian VK1DI/p; Col VK5HCF; Andy VK5AKH; Glen VK3YY/p (SOTA); Marshall VK3MRG/p (SOTA); Ray VK3YAR/p (SOTA); Jim VK5KOB; David VK5KC; Brian VK5FMID; Allen VK3HRA/p (SOTA); Andrew VK2UH; Greg VK2FGJW/p; Andy VK5LA; & Kevin VK3KAB/p (SOTA). 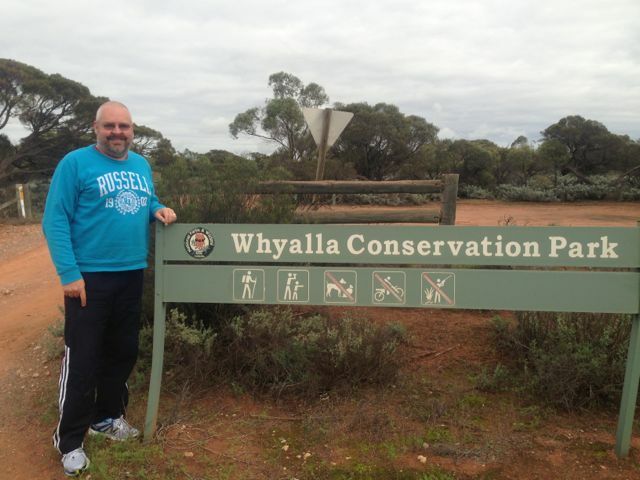 On Saturday afternoon, 15th June, 2013, on my way back to Whyalla I stopped in at the Wharminda Conservation Park. 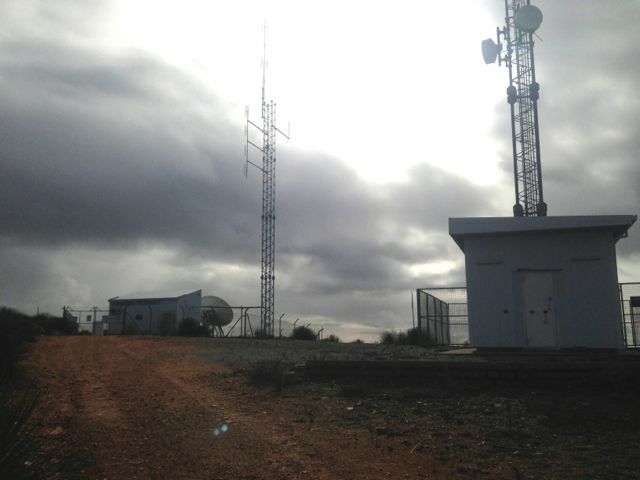 I had intended to activate my 11th SOTA summit that afternoon, but the weather on the southern Eyre Peninsula was very poor, so unfortunately I had to cancel the hike. 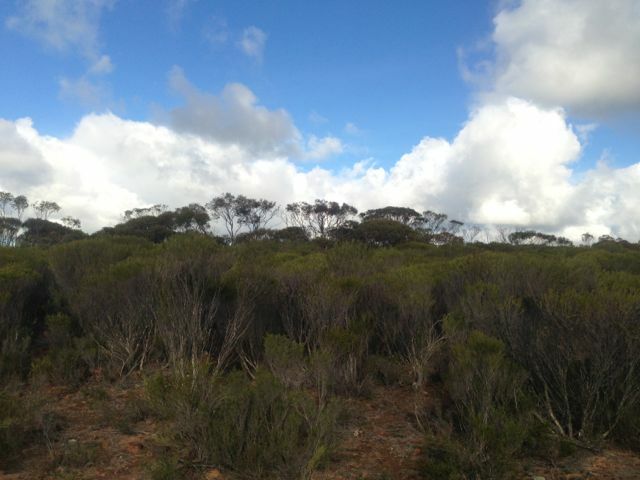 Wharminda Conservation Park is situated on the Eyre Peninsula, a few kms from the little railway siding of Wharminda. It is about 42 kms south west of the seaside town of Arno Bay. I travelled north out of Wharminda and access the park on its northern side. The roads throughout the area here are all dirt. And they were in quite poor condition after all the rain we had received over the week. So at times it was a bit of a challenge with the Falcon XR6. The park is located in close proximity to the much larger Hincks Conservation Park, but I could not get there because of the road conditions. 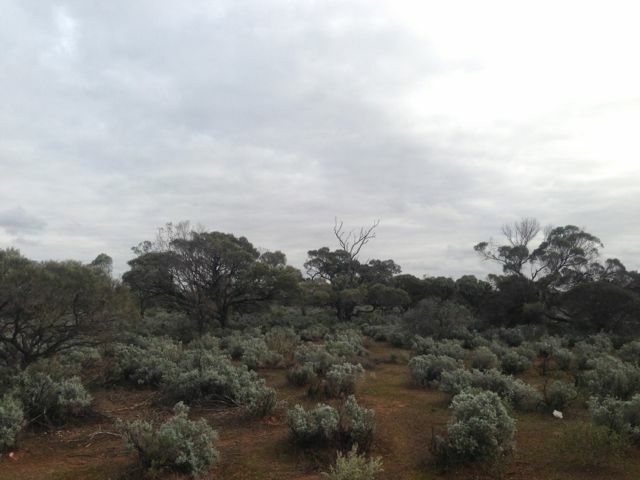 Wharminda CP which was proclaimed in 1985, consists of about 269 hectares of mallee and shrubland. 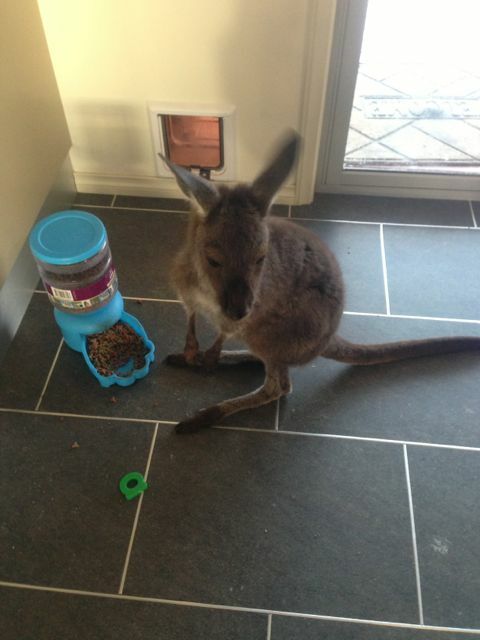 The park supports a large variety of fauna including Western Grey kangaroos, Hopping Mice, and Dunnarts. Numerous bird species are also found including emus, Fairy wrens, mallee fowl, and a variety of parrots. I set up the dipole and unfolded my deck chair and enjoyed the sunshine. 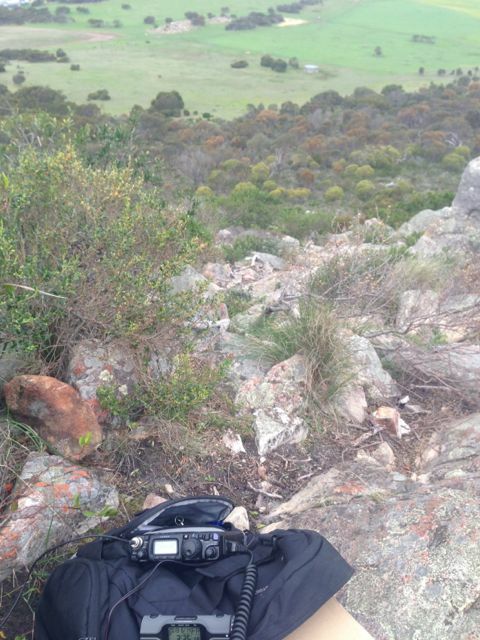 My first contact within the park was with Ian VK5CZ who was portable on Mount Nadjuri, VK5/ NE-058. I then spoke with Ernie VK3DET who was portable on VK3/ VS-050. I then set up on 7.099 and called CQ and was ‘Hunted’ by some of the usual suspects including John VK5FTCT, John VK5BJE, Roy VK5NRG, Btriran VK5FMID, Col VK5HCF, and Peter VK3PF. Peter VK3PF advised that by working me, he had just tipped over the 20 point mark, qualifying him for the Silver Award for the VK5 Parks Award. I also spoke with Steve VK5AIM who was portable in the Sandy Creek Conservation Park, as part of the VK5 National & Conservation Parks Award. Steve had a very nice signal (5/8 both ways). After placing the unlucky number of 13 QSO’s in the log, I packed up the gear and headed north to Whyalla, which was still about 200 kms away. The following stations were worked:- Ian VK5CZ/p (SOTA); Ernie VK3DET/p (SOTA); John VK5FTCT; John VK5BJE; Steve VK5AIM/p (Sandy Ck CP); Roy VK5NRG; Brian VK5FMID; Col VK5HCF; Peter VK3PF; John VK5FMJC; David VK5LSB; David VK5UG; and Mal VK5MJ/m. 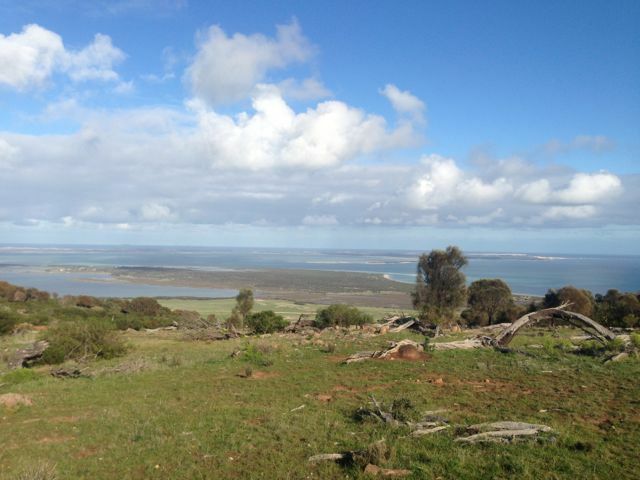 My last activation for the Friday, 14th June, 2013, was the Coffin Bay National Park. I was a bit puffed out after 2 SOTA activations during the day, so I thought a quick activation of the park would be good before heading back to Port Lincoln, for a feed and a beer or two. Coffin Bay National Park is situated about 46 kms west of Port Lincoln on the Eyre Peninsula, and about 703 kms west of Adelaide. The park consists of about 31,000 hectares. 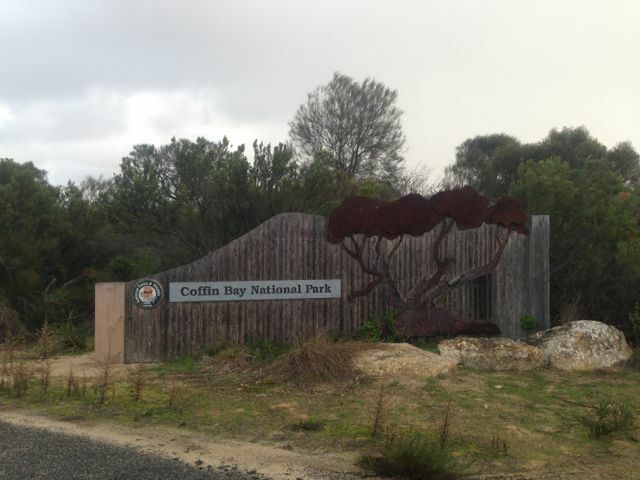 The beautiful town of Coffin Bay is located near the entrance to the National Park. Coffin Bay is renowned for its oyster farming, and I couldn’t resist buying a few dozen fresh oysters. Coffin Bay was named by explorer Matthew Flinders after his friend the naval officer, Isaac Coffin. The Coffin Bay NP features a long peninsula with a sheltered bay, coastal dunes, swamps and a spectacular coastline of islands, reefs, limestone cliffs and white surf beaches. To the east of Point Avoid are Almonta and Gunyah Beaches, used for surfing. Reefs extend out to sea from Point Avoid to Golden Island with Price Island further out. 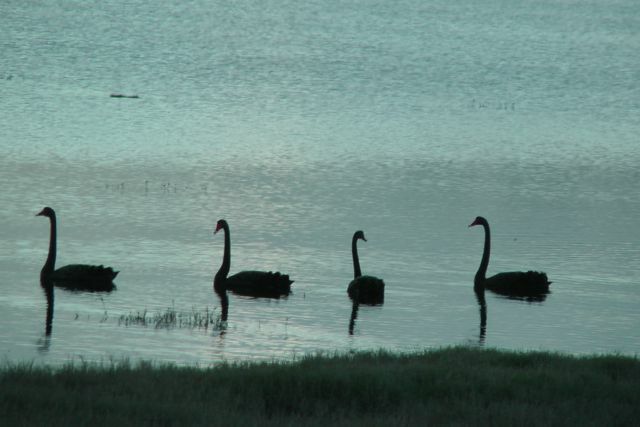 There is a great variety of wildlife in the national park. Numerous seabirds can be seen including White-bellied Sea Eagles and Ospreys was well as various albatross and petrels. The area covered by the national park is also classified by BirdLife International as an Important Bird Area. It supports over 1% of the world populations of Pied and Sooty Oystercatchers, as well as significant numbers of Fairy Terns, Hooded Plovers, Western Whipbirds, Rock Parrots, and Blue breasted Fairy wrens. I pulled into an area of the park called Middle Well and started setting up the equipment. I almost had to move because of a rather inquisitive emu. The weather was holding up okay, but there was the threat of rain out to the east. I ended up working a total of 9 stations on 40m SSB, before having to pack up due to the weather. The following stations were worked:- Col VK5HCF; Nev VK5WG; Peter VK3PF; Brian VK5FMID; David VK5KC; Larry VK5LY; John VK5BJE; David VK5UG; and John VK5FTCT. Mount Greenly, VK5/ SW-033, was my 2nd summit for Friday 14th June, 2013. Mt Greenly is 305 metres above sea level and is worth 1 point. It is located about 5 kms north west of the little town of Coulta on the lower Eyre Peninsula, and about 705 kms from Adelaide. 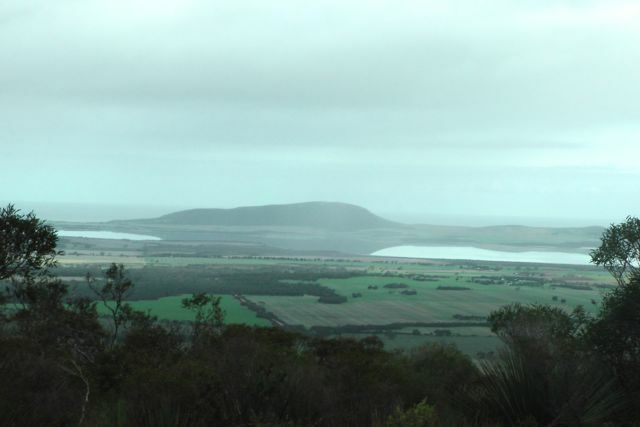 The summit overlooks the large salt lake, Lake Greenly to the east and the Great Australian Bight to the west, and is surrounded on 3 sides by picturesque sheep and cereal farming country. I brought forward the activation time of this summit by one hour, simply because of the weather which was pretty lousy. Rain and showers had been hanging around all day, and I was quite keen to get the summit under my belt and head back to the motel room. Mount Greenly was named by Captain Matthew Flinders on the 16th February, 1802, after the fiancee of Sir Isaac Coffin who aided Flinders in the selection and fitting out of the Investigator. The summit itself is located on private property owned by Peter & Louise PUCKRIDGE. I contacted them prior to climbing the hill, and they were very friendly and helpful. 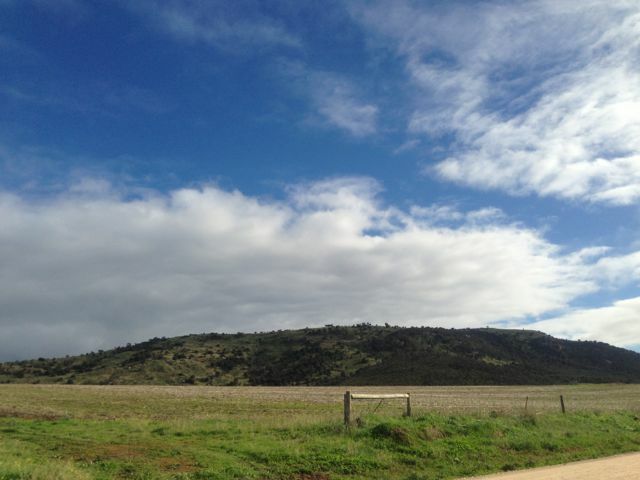 There is a hill, located 4 km to the south of Mount Greenly, which can be confused for Mount Dutton. 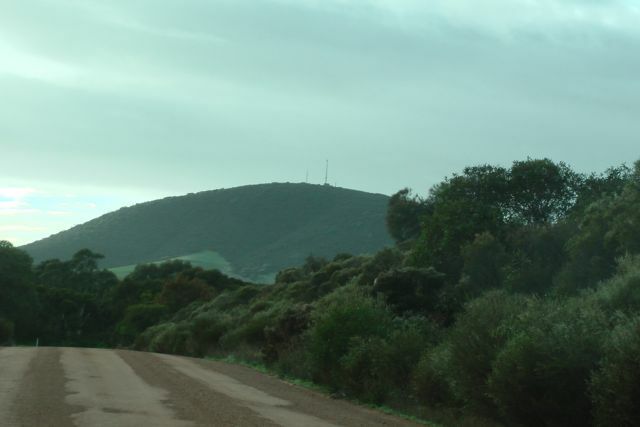 The hill is named Frenchman, and is 168 metres high. It takes its name from the French whalers who used it as a lookout during the early 1800’s. Although imposing in itself, it does not qualify for SOTA as it does not have sufficient prominence. Access to the Mount Greenly summit is via Coles Point Road, which runs off the Flinders Highway,about 3 kms before the town of Coulta. 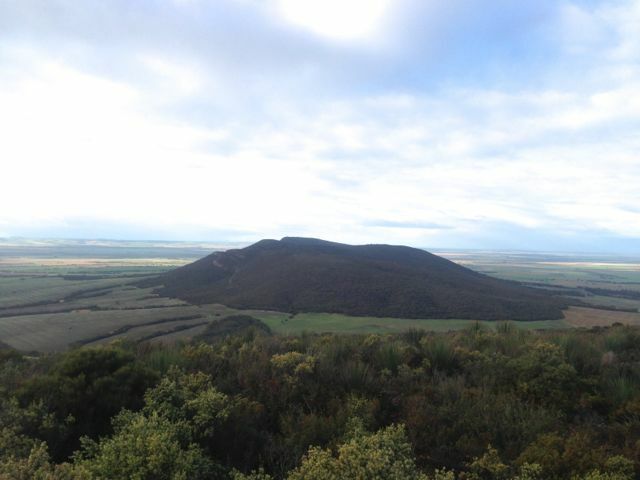 You can’t miss seeing the summit, as it is an imposing figure in a relatively flat lanscape. The name ‘Coulta’ is derived from the local Aboriginal people who called a nearby spring ‘Koolta’. Travel west along Coles Point Road for a distance of about 10 kms, and then turn right into Greenly Beach Road. Almost immediately after turning right you will find another dirt road on your right which leads you to a parking area. I parked the car at the end of that dirt road, and walked the rest of the way to the summit, which was about 3 kms to the top. 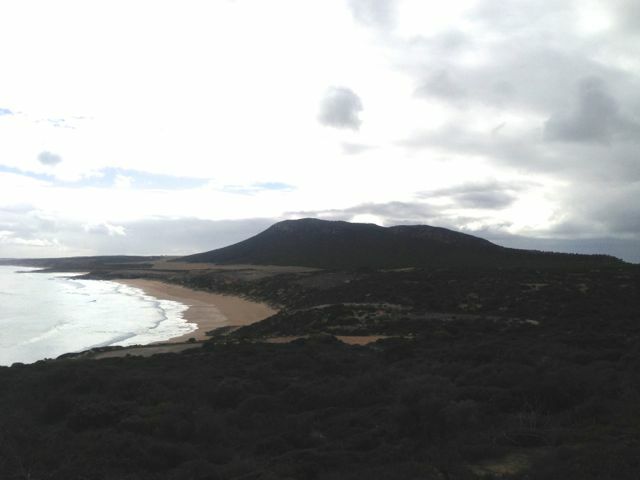 Prior to climbing the hill I drove down to Coles Point to look at the rugged coastline and the Great Australian Bight. There is a monument here to a young gentleman who drowned here back in 1941. There are also terrific view back to the western side of Mount Greenly. It is well worth a drive down to the coastline to have a look. The beach is often frequented by surfers, although the area also has a reputation for its man eating Great White sharks. Greenly Beach made it into the top 101 beaches of Australia. The first part of the walk to the summit is certainly not easy. There is no track. 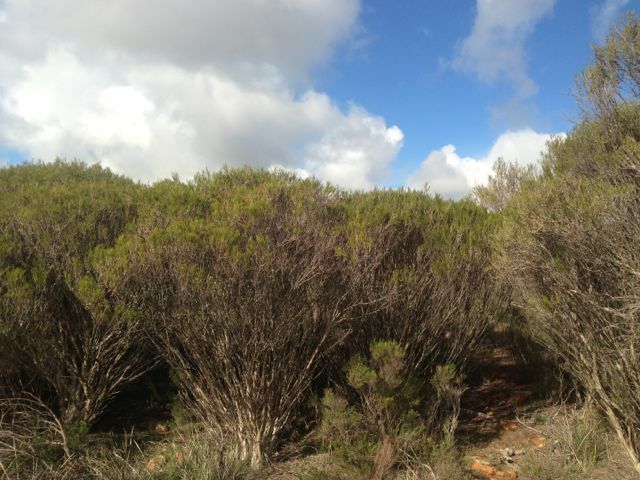 You need to make your way through some pretty thick scrub to the low ridgeline on the southern side of the summit. This was certainly the hardest part of the walk. Once I reached the ridgeline it was much easier going from there, but still a challenge. 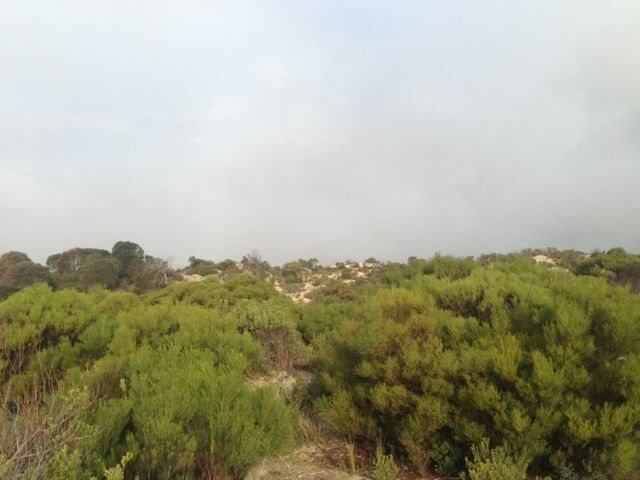 The ridegline is very rocky and has quite a bit of thick vegetation in parts. But it is a slow and steady incline up to the actual peak of Mount Greenly. 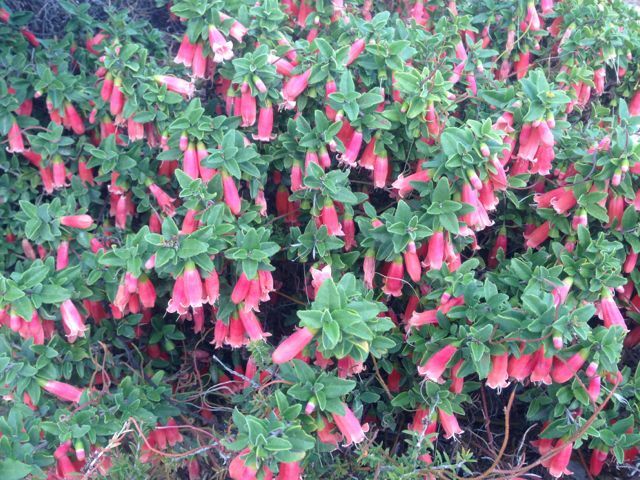 There were quite a few plants that were in flower on the summit. They included correas, grevillias, wattles, flame heath, and gums. And the rock formations are truly quite amazing. Once you reach the actual summit, there is no trig point. There is a pile of rocks which has gradually been growing, as more and more people climb this hill. There was very little room to move right up the top, so I climbed back down a little bit and set up on the southern side of the summit. The view on the top is quite impressive. To the south you can see Mount Dutton and the nearby Frenchman & Mena Hill, and beautiful lush green crops in between. To the north are also lush green crops. To the east you can see North & South Block and Lake Greenly, lying just below the summit. And to the west you have the wilds of the Great Australian Bight and Greenly Beach. The weather on the top of the hill was pretty wild and woolly. I guess that’s what you would expect when it is the middle of winter, and you have the Great Australian Bight just over your shoulder. I managed to secure the squid pole to a bush using 2 octopus straps, but the wind was so strong that at one stage it collapsed on itself. Apparently they hang glide from this hill. Sadly I didn’t get any summit to summit QSO’s. I was carefully watching SotaWatch hoping that Ian VK1DI was going come up. Ian had planned to activate The Dutchman’s Stern in the Flinders Ranges, whilst over here on holidays in South Australia. Ian did give me a call but advised that he had not reached the actual summit of The Dutchmans Stern, so no s2s. 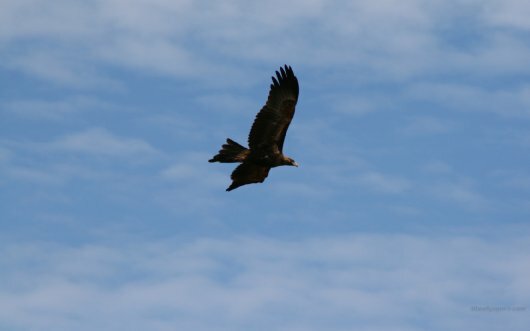 During my time on the hill I had a friendly Wedge Tailed eagle constantly soaring in the wind above the summit. I managed a total of 19 QSO’s on 40m SSB. The following stations were worked:- Col VK5HCF; Brian VK5FMID; Paul VK5FUZZ; Tony VK3CAT/m; Andrew VK2UH; Ernie VK3DET; John VK2YW; VK3JP; Rik VK3KAN/m; Bernard VK3AMB; Glenn VK3YY; John VK5FTCT; Ron VK3AFW/m; Ian VK1DI/5; Peter VK3PF; Rhett VK3GHZ; Jim VK5JW; Bill VK5MBD; and Mark VK7FMPR. The following is a video of my activation which I have uploaded to You Tube. 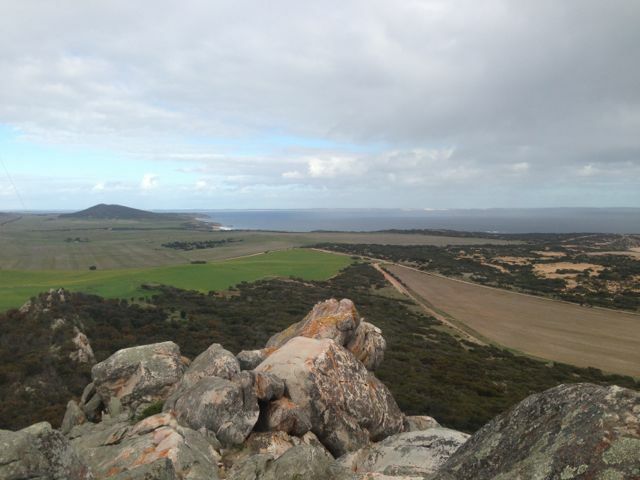 On Friday morning, 14th June, 2013, I got up bright and early and headed for Mount Dutton, VK5/ SW-035, which is situated about 48 kms north west of Port Lincoln on the lower Eyre Peninsula. 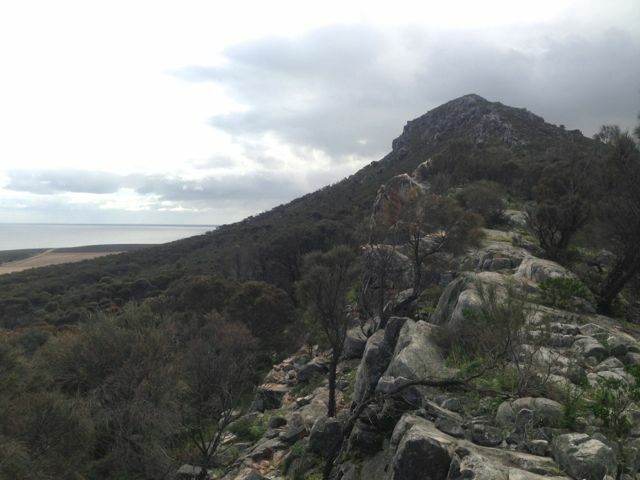 Mount Dutton was named after Charles Christian DUTTON, an explorer, who in 1839, led a small expedition from Port Lincoln to Coffin Bay. DUTTON was an early Sheriff of the Province and then settled in the Port Lincoln district. He died at age 32 in 1842. 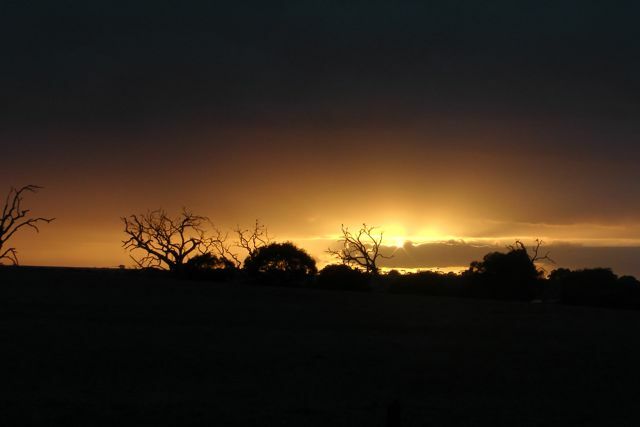 I travelled out along the Flinders Highway towards the town of Wangary, and watched the spectacular sunrise. And at the same time keeping a close watch for kangaroos. There are plenty of roos over here on the Eyre Peninsula. At Wangary, turn left into Farm Beach Road and travel west towards the ocean. It is worth a quick detour down to Farm Beach and Gallipoli Beach, which featured in Peter WEIR’s Australian movie ‘Gallipoli’. After travelling down Farm Beach Road for about 5 kms turn right into Broccabruna Drive. There is a brown sign here saying ‘Frenchman 14’. Travel about 1 km along Broccabruna Dr and then veer left onto Mena Road. There is a brown sign here saying ‘Frenchman 13’. About 3 kms up Mena Road, you will see an old derelict cottage just set off the road amongst trees and shrubs. There is a large tall palm tree here as well to keep an eye out for. Directly opposite this, you will see a large cocky’s gate. I travelled from here through the paddock to the base of the hill. It is about a 3 km walk from there to the summit. The first part of this walk is a bit of a challenge. There is no track and the scrub is quite thick in parts. It is pretty easy to get disorientated. Once you do reach the top there are spectacular views out in all directions. Particularly to the south. 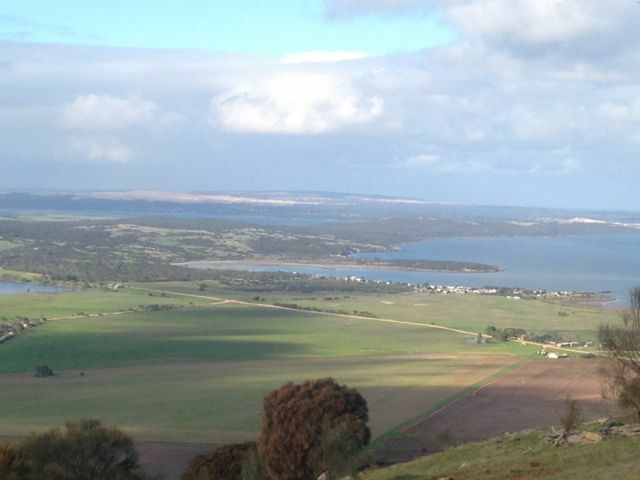 The views of Mount Dutton Bay, Coffin Bay, and the Coffin Bay National Park are truly amazing. The hill is surrounded by lush sheep and cereal farming land. The walk along the ridgeline on the top of the hill is quite easy, and there are plenty of spots to explore. During the late 1800’s, nearby Dutton Bay was a valuable ‘land-sea link’, as a jetty was built adjacent to the large Dutton Bay woolshed. At its peak, over 20,000 sheep were shorn within the woolshed. Up to 100,000 fleeces were baled and loaded onto ketches from the adjoining jetty, for overseas markets. There are quite a few trees and shrubs and rocks on the top, so plenty of options in securing the ends of the dipole. 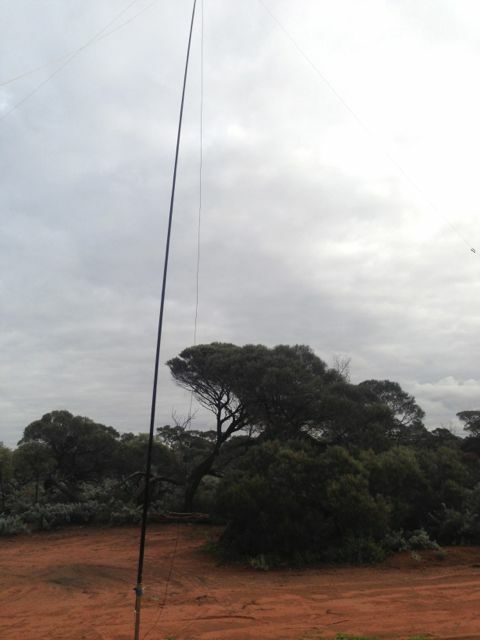 I set up the 40m/20m linked dipole on the 7m squid pole, using a fallen tree and some rocks to secure it into place. The tree made a good bench. I put a CQ call out, and worked a total of 15 stations before the UTC rollover, and a total of 24 stations after the UTC rollover. Stations worked before the UTC rollover were:- Ian VK5CZ; Roger VK5NWE; Peter VK3PF; Glenn VK3YY; Rik VK3KAN/m; David VK3VDL/m; Ron VK3AFW/m; Tony VK3CAT; David VK5UG; Nev VK5WG; David VK5LSB; Ernie VK3DET; Urey VK3ATA; Dennis VK5LDM; and Mike VK5MCB. Stations worked after the UTC roll over were:- Rik VK3KAN/m; David VK5UG; Nev VK5WG; Ron VK3AFW/m; Peter VK3PF; Col VK5HCF; David VK5LSB; Les VK5KLD; Mike VK5MCB; Tony VK3CAT/m; Ernie VK3DET; Rhett VK3GHZ; VK3JP; Ian VK5CZ; David VK3VDL; VK3JM; Glenn VK3YY; Dennis VK5LDM; Jim VK5JW; Colin VK3NCC/2; Urey VK3ATA; Brian VK5FMID; John VK5FTCT, and Mark VK7FMPR. Below is a video of my activation, which I have posted on You Tube.